Private Cottage on an acre lot at Keawakapu Beach - This is island living! Two restored cottages just steps to Maui's Keawakapu Beach (literally 1-minute walk on paved sidewalk, no car needed) are now available as permitted vacation rentals. (VRBO#736502 & VRBO#785888) Steps from the best sandy swim beach, Maui Mango Cottages offer a local experience for visitors who want privacy and space adjacent to Wailea Resort amenities including restaurants, golf, spas, shopping and a 3-mile-loop beach walking path. The island-style beach cottages sit on the border of Wailea and Kihei offering the best of both experiences. Mature mango trees have provided shade and fruit to the landscaped acre of land for more than half a century as the cottages were some of the first dwellings in south Maui. Enjoy space for your entire family or party up to 10 when you rent both cottages. 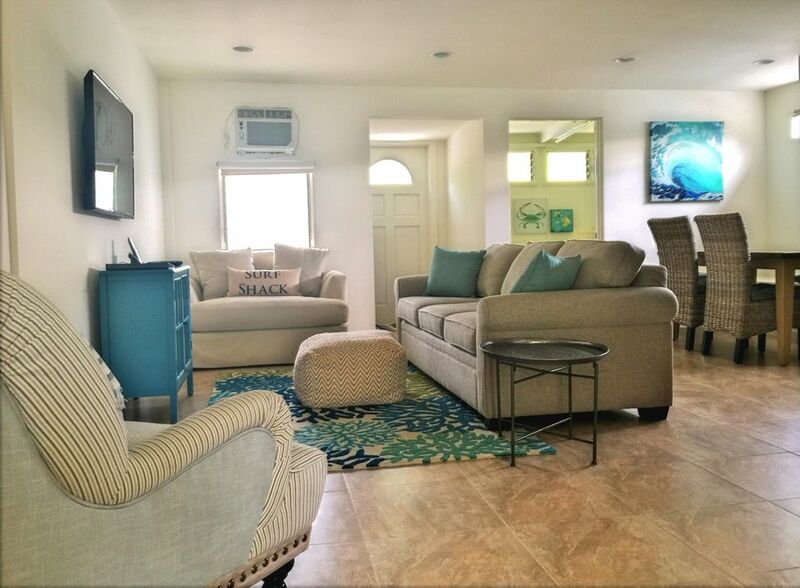 Window A/C units throughout, all the amenities of home with island inspiration -relaxing lanai, kitchen stocked with all the utensils and dishes, and mango trees providing shade and mangos for breakfast in season. The cottage is one of two houses on the 1-acre property with a large landscaped yard and parking. Beach chairs and boogie boards are provided and carried easily down the sidewalk the short 1-minute walk to the beach. We invite you to enjoy our corner of paradise where sunshine meets the sand and surf, and where you are sure to create lifetime memories. The location of our Maui Mango Cottages is unique. Situated on nearly an acre of land dotted with mature mango trees and accessible front door parking, guests are only steps away from pristine Keawakapu Beach. You won't have to drive to the beach and can carry a small beach chair and cooler easily across the street for a day in the sun or toast the sunset with a glass of wine and an ocean swim. Often considered Maui's best beach, Keawakapu is a long sandy beach perfect for popular ocean activities such as swimming, snorkeling, stand up paddling, boogie boarding, and even surfing on occasion. Enjoy our beach chairs and boogie boards complimentary during your stay. It was an amazing stay. The location is ideal, just one block if that away from the beach. We also had parking right outside our door. The unit itself is very well kept, clean and stocked with everything one needs. Our families spent a week at both cottages and we had a fabulous time! Cottage 2 was a bit older than 1 but was more than sufficient for our requirements. Can’t beat the location for sure, 5 mins from door to the best beach on the island. The cottages were very comfortable as well, with AC, which was much required in early August. They have the necessary amenities and beach gear which made it very convenient and enjoyable. The large yard and beautiful mango trees were a treat especially for the kids. We enjoyed mangoes for breakfast everyday! Kitchen is fully stocked with appliances and utensils, but definitely expect to bring your own condiments, spices etc. Yvonne and Charlie were always reachable and responsive to any queries, throughout the booking process and during the stay. Thank you very much for sharing the cottages! Hope to be back again! Great place to stay and take in the beauty of Maui. The cottage is in such a convenient location with easy access to the entire island and a short walk to a beautiful beach. OWNER DID NOT PROVIDE ACCESS TO HOUSE TILL 3RD DAY; otherwise satisfied with rental. It was very upsetting and disturbing when you're already on your way but you don't know if you'd have a place to stay. That was a horrible start to my vacation. Thankfully a neighbor told me how their door code relates to their phone number, which helped us figure out ours. After several more attempts calling the owners, I finally reached them on our 3rd day in the house. OTHER THAN THAT, THIS WOULD HAVE BEEN A 4-STAR RATING. I can't speak highly enough of the location. Look at the map. I couldn't have asked for better. The back yard is nice and shady. The owners let us stay late on the last day to catch our late flight. Beach chairs, sand toys, beach towels, beach umbrella were available (though the umbrella was partially broken). Nice and clean interior with cool tile floor. Outdoor shower is cool, if you're into it. No shower inside. Big outdoor grill; however 1 of the 3 burners didn't work. For a rental for 5, it only has an outdoor table on the deck for 2. That seems like an easy purchase that the owners didn't make. No AC in the small bedroom with the two twin beds. No closet in that bedroom either. The owners didn't leave any condiments or spices left behind from previous renters. We're used to seeing these from previous rentals. The fridge and cupboards were bare except for pots, pans, plates, cups, utensils, etc. So buy your own ketchup. No filtered water. Fridge has no water dispenser. No indoor shower if you don't like the outdoor one. Beds and furniture are of basic quality. Need cushions on the dining room bench. Wow! After 24 straight 5 star ratings there is a 1 star rating. To be clear, the 1 star rating is not for the house/accommodations (the traveler gave 4 stars for that) but instead the 1 star is for a miscommunication problem between guest and owner. This guest was inside the house within 5 minutes of arrival to the property. Apparently the guest was calling/texting an incorrect phone number (for 3 days according to the review) and misinterpreted that as owners unresponsive (which generated the 1 star rating). Our standard policy is to provide the access code to the house information days before arrival but apparently the traveler misplaced that information. We are happy to know the guest enjoyed the accommodations. The cottage was perfect for 5 adults and our grandson. Clean neat and tidy (key criteria for my wife). The kitchen was well stocked. The king bed in the master bedroom was great. The air conditioning was very nice to have. We spent lots of time on the deck and in the grass in the back yard - morning coffees, fresh cinnamon buns from the oven, evening drinks. The neighbourhood is very quiet. It was so peaceful. Access to the beach is great. A very easy walk to a mile long beach that is quiet. Thoroughly enjoyed long walks with our grandson in the stroller and yet so close to our cottage. Yvonne was very helpful in ensuring we had a few things for our 10 month old grandson. Thanks Yvonne. Mango cottage is a lovely holiday home with all the mod cons and essential amenities that you need for a great beach holiday. Central to both Kihei and Wailea beaches, quiet and private, it makes a great alternative to all those condos. The outdoor shower is awesome! All the local beaches are excellent, although not great snorkelling during winter. Take the chance to snorkel Molokino, and we had a great trip with Redline Rafts. Hearing the whales calling when under water is pretty cool. Charlie and Yvonne were really helpful and when needed to fix an annoying smoke alarm, were there within the hour on a Sunday morning. Service! We would love to stay here again if lucky enough to visit Maui again. Mahalo! Maui Mango Cottages are located just steps from world-famous Keawakapu Beach on the magical island of Maui. Privacy with all the amenities of a fully-stocked home, the beach cottage getaways have just been remodeled and are new vacation rentals. Access Wailea Resorts world-class restaurants, 3 championship golf courses, tennis, shopping, beach and more. Choose to spend the day relaxing on Maui's best swimmable beach or set out for adventure and all that Maui has to offer. Cancellation Policy: 1) Cancellations that are more than 60 days from check-in date will receive a full refund, less a $250.00 cancellation fee. 2) Cancellations less than 60 days from check-in date will not receive a refund.